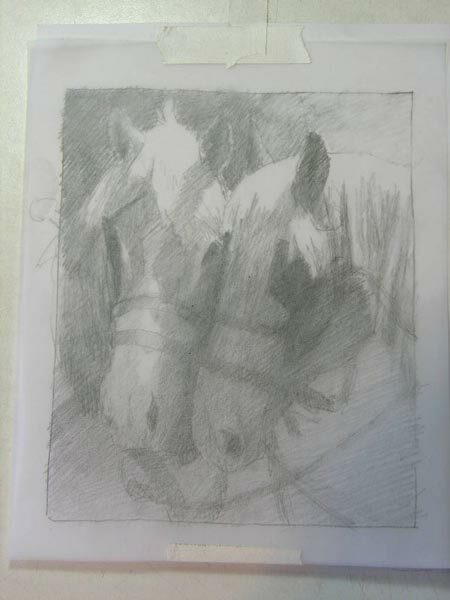 I start with a sketch to determine the composition and values. 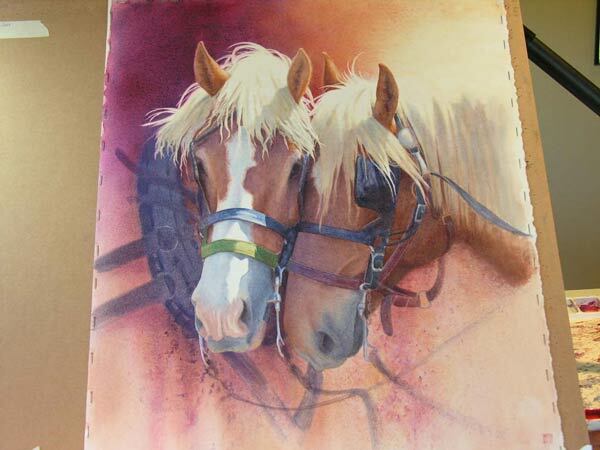 This painting is done on Arches 300lb coldpress. 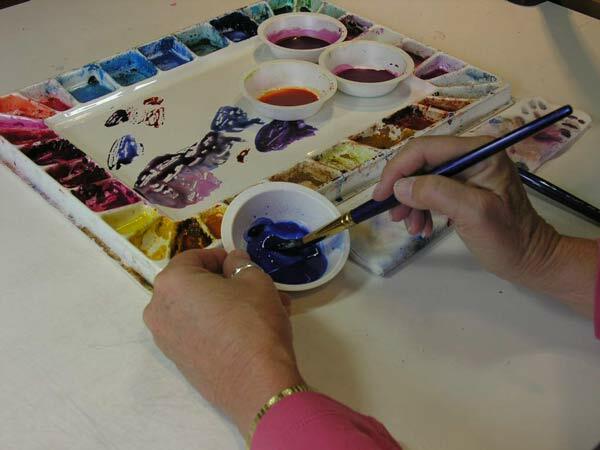 I use Daniel Smith paint and work with a limited number of colors: French Ultramarine, Quinacridone Gold, Quinacridone Sienna, and Quinacridone Rose. I mixed up several small tubs of color because I knew I was going to be using quite a bit of paint for my background washes. 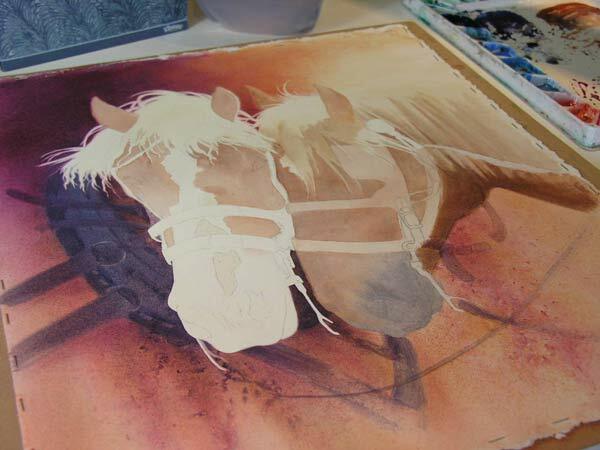 I applied masking fluid to the outer portions of the horses. 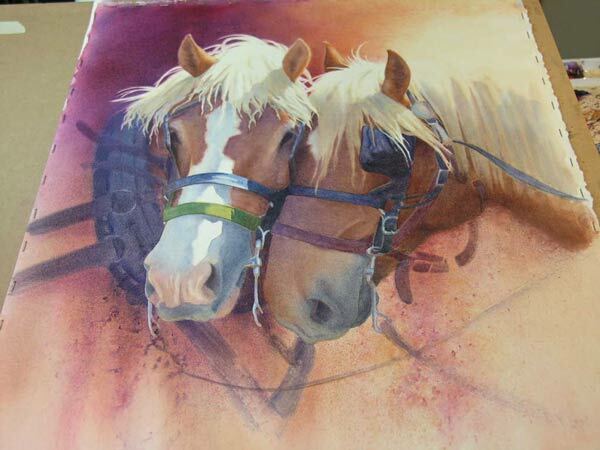 I knew I was going to be working with lots of wet in wet washes for the background and didn't want the paint to flow into the image of the horses. Next I brushed in Quinacridone Sienna. 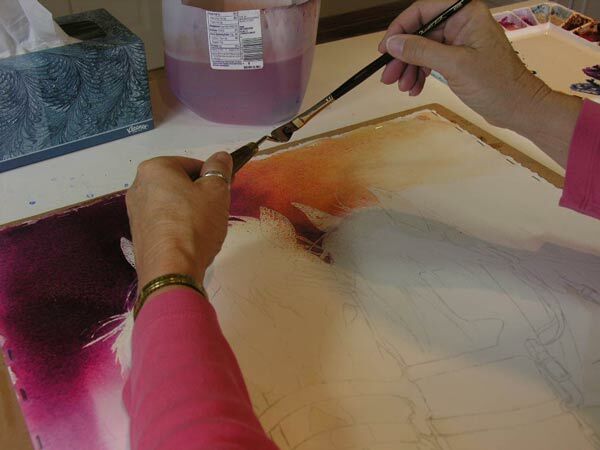 I often will use an old oil brush to spatter color into an area. This gives an airbrush effect. 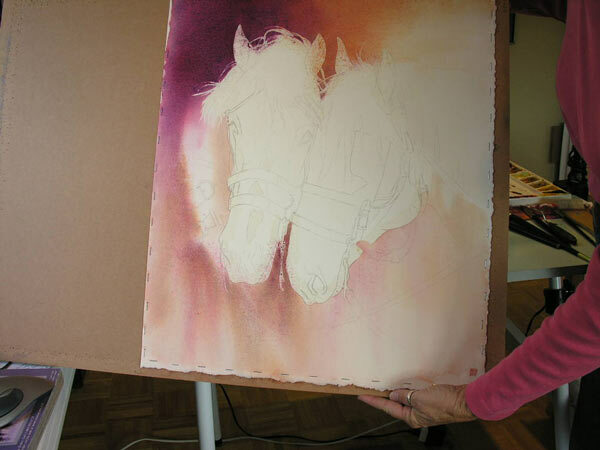 I continue to add washes of color in a series of steps. 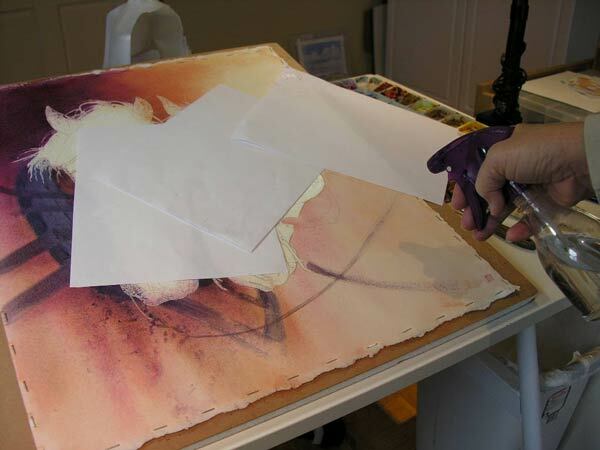 Notice that by tilting the board while the surface is pretty wet the color will slip and slide in various directions giving some lovely, soft blends. 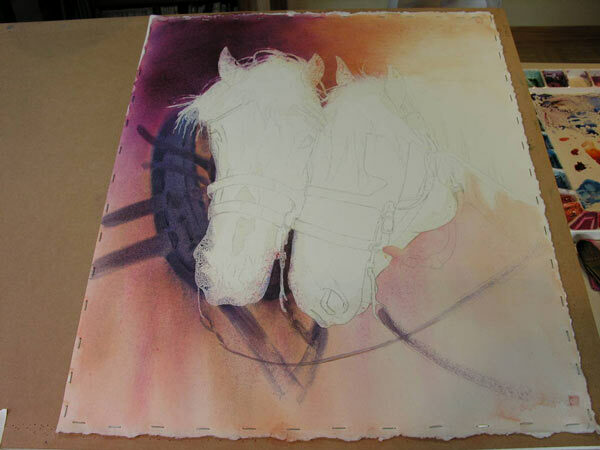 In this step I added the harness and reins. 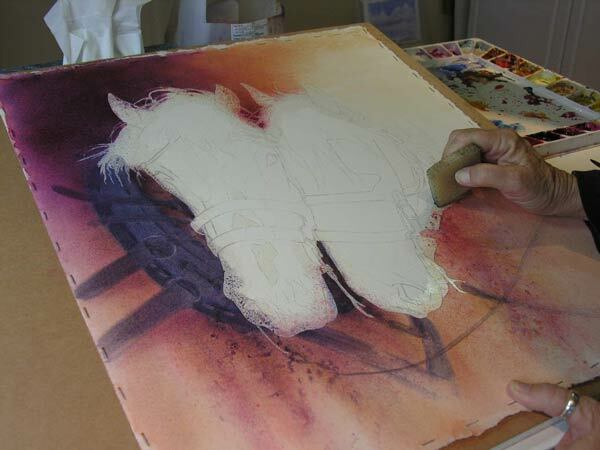 The harness was painted into damp paper so that I could achieve some soft edges. 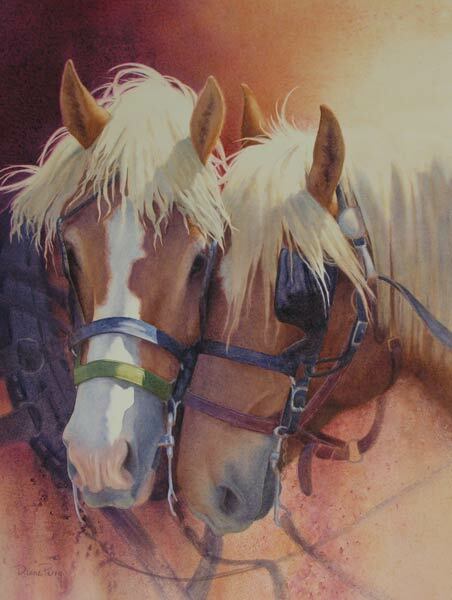 The reins were dry brushed in. 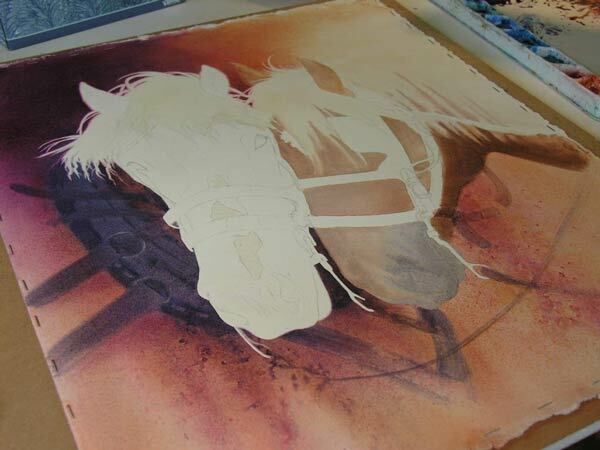 In preparation for some spattering in the background under the right horse I cover parts of the painting that I want to protect from stray spatters with ordinary printer paper. Next I spray clear water droplets on the area of paper I want my spattering and texture to be. I am careful not to cover the entire paper surface with the water. Now I work with a brush loaded with color and tap it against the handle of another brush. 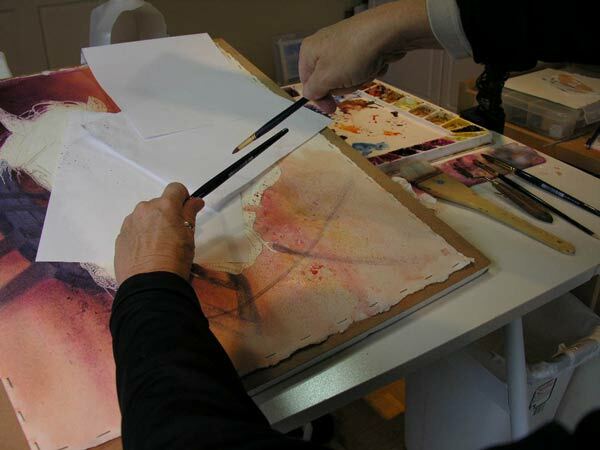 With each tap paint is spattered onto the paper. When a droplet of paint falls into a droplet of water the paint takes the shape of the water droplet on the paper, creating very interesting textures. 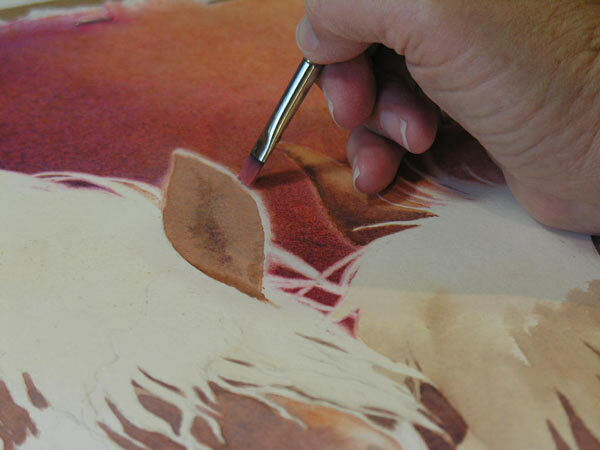 It's time to carefully remove the dried masking fluid from the paper using a Rubber Cement Pick Up tool. I want to make sure my paper surface is completely dry for this step. 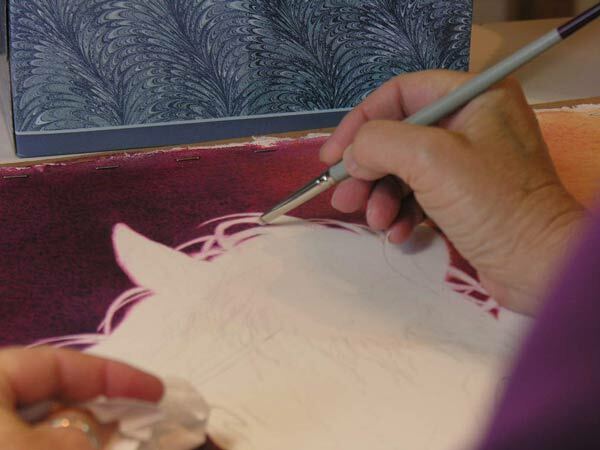 When using masking fluid you get hard, cut out looking shapes. 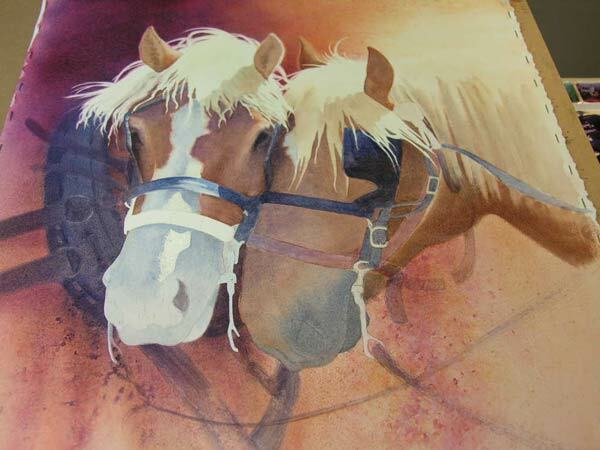 So I often go back in with a scrubber brush and soften these shapes and lines, especially in the hair in the manes. 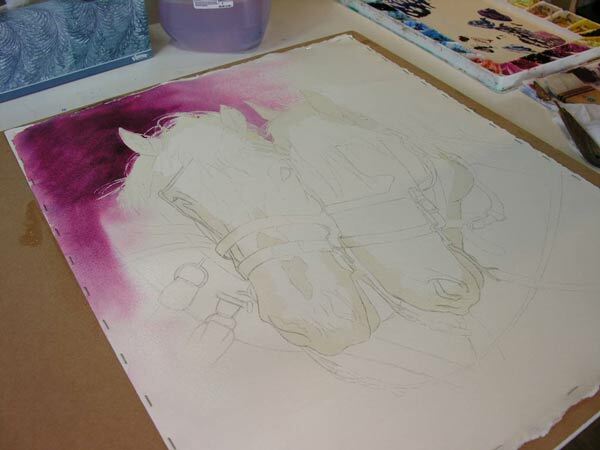 Now it's time to begin painting the horses. I want to show the light catching the soft edge of the ears so I need to lift out some paint on that lighted edge. 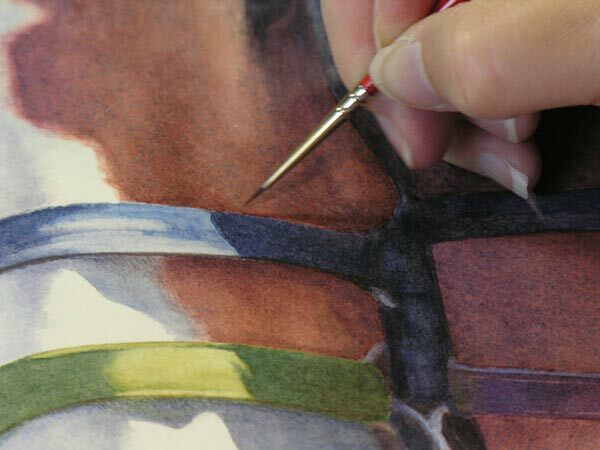 I do this with a bright oil brush...it's my favorite brush for lifting. I paint various sections building up the painting in a number of different steps. The over all painting is worked on throughout the process. I rarely complete a section before moving on to another section. It's done as a whole. 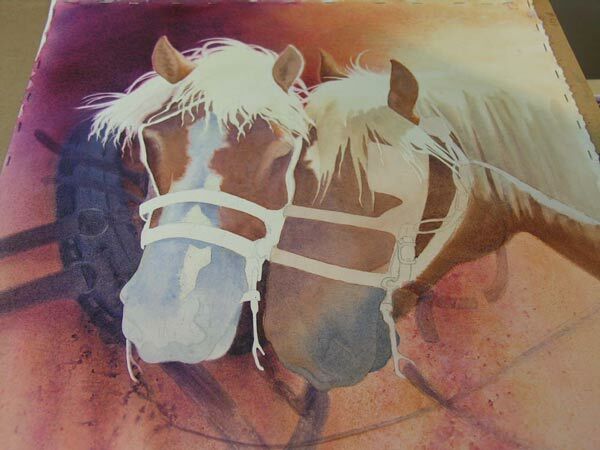 ...and have the bridles complete for the most part in this phase. It's time to do some fine tuning. 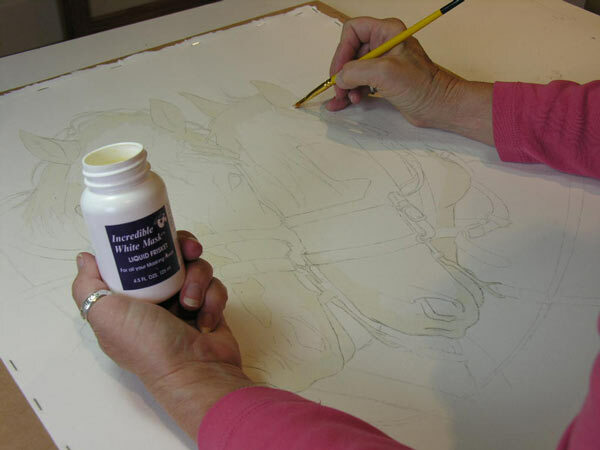 Here I'm using a small brush to touch up areas that either need paint added or some stray dark areas lifted. 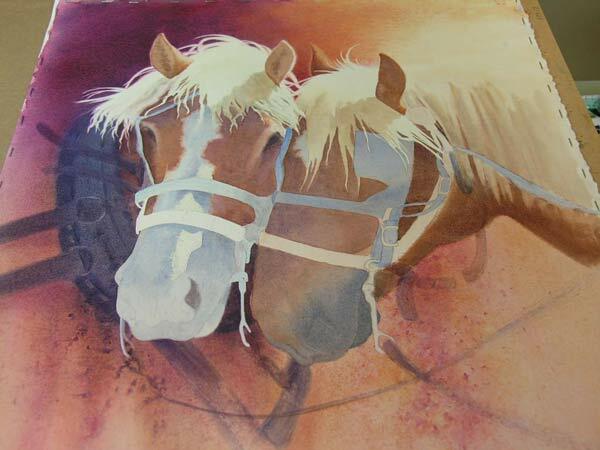 I wasn't happy with the layout of the reins but wasn't sure how I wanted to change them. 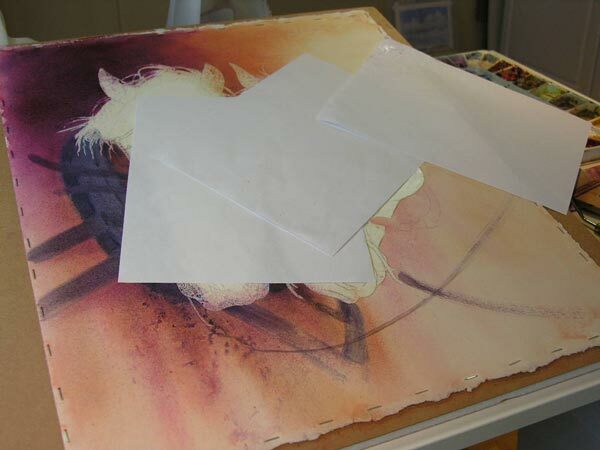 When in doubt I often will use tracing paper to work out the problem. 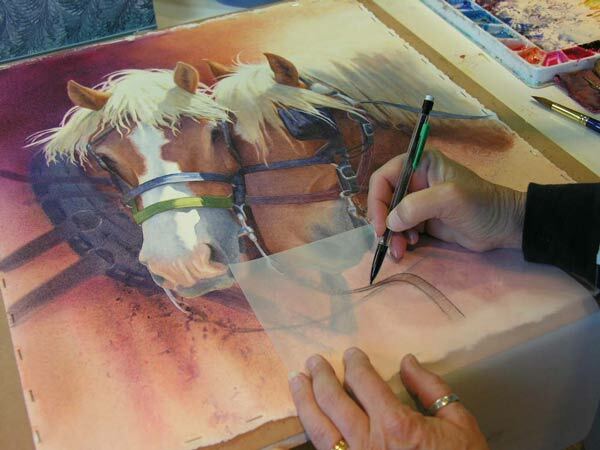 By placing the paper over the dry painting I can work out my composition and placement on the tracing paper until I'm satisfied. 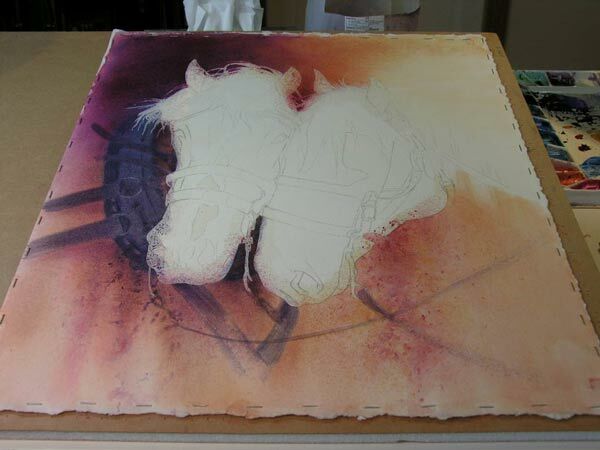 This view shows the new placement of the reins after I worked it out on the tracing paper. I'm much happier with it. The last thing is to decide exactly how I want it cropped and then sign it.